The history of the Pit Bull can be traced back to the early 1800’s in the United Kingdom. Pit Bulls were originally bred from Old English Bulldogs (these dogs are similar in appearance to today’s American Bulldog) who gained their popularity on the British Isles in a cruel blood sport known as “bull baiting”. One to two Bulldogs were set to harass a bull for hours until the animal collapsed from fatigue, injuries or both. These matches were held for the entertainment of the struggling classes; a source of relief from the tedium of hardship. However, in 1835 the British Parliament enacted the Cruelty to Animals Act 1835, which prohibited the baiting of some animals such as the bull and bear. Once bull and bear baiting was outlawed, the public turned their attention to “ratting”. 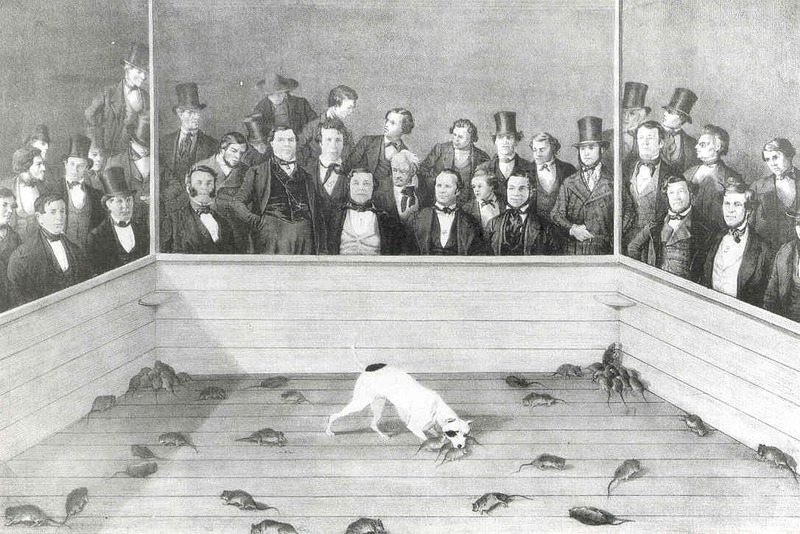 This practice pitted dogs against rats in which they were timed to see whose dog would kill the most rats in the least amount of time. The “pit” in Pit Bull comes from ratting as the rats were placed into a pit so that they could not escape. Ultimately, the public turned their eyes upon dog fighting as it was more easily hidden from view and thus the law. Ratting and dog fighting both required more agility and speed on the part of the dog, so Bulldogs were crossed with Terriers “Bull and Terriers”, more commonly known as the first Pit Bull Terrier. Despite their tenacity and determination in battle, commoners actually bred pit bull terriers with some of the same qualities and traits that we still love about them to this day. Through selective breeding and culling, bite inhibition towards humans was greatly encouraged. Gamblers had to be sure that they could enter a pit and handle their dogs in close proximity without the danger of being bit themselves. If a dog bit a human, it was usually culled. Shortly before the Civil War, immigrants from the British Isles came to the United States, but along with them came their Pit Bulls. It was during this time that the Pit Bull Terrier breed was named the “American” Pit Bull Terrier. Though these dogs had been specifically bred for fighting, they soon became a much larger and invaluable fixture in a developing nation. In early America, these frontier dogs took on an all-purpose role. They were responsible for herding cattle, herding sheep, guarding livestock and families from thieves and wild animals, helping on the hunts and as hog catchers. Their loyal and loving demeanor with humans, especially children (this is where the “Nanny Dog” myth originated from), earned them a prominent place not only as a working dog, but as a companion. Check out our friends at Bad Rap’s, Vintage Photo Gallery. During the first half of the American century, Pit Bulls remained a prominent part of culture. Public attention turned away from fighting dogs and they began to see them as working class companions. The USA admired this breed for qualities that it likened in itself; friendly, brave, hardworking, worthy of respect and they became, the “All American Dog”. 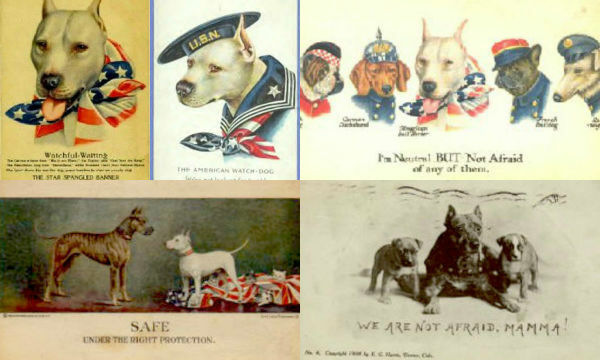 During WWI and WWII, Pit Bulls were used as the nation’s mascot. Their image of bravery and loyalty was displayed throughout advertisements during war time. The more notable of the first war-dogs was Sergeant Stubby. Sergeant Stubby has been called the most decorated war dog of WWI and the only dog to be nominated for rank and then promoted to sergeant through combat. He served 18 months on the front lines in 17 battles and 4 different campaigns. Sergeant Stubby is just one example of the many other Pit Bulls that have served their country in war time. Click here for more amazing war dogs! In addition to their war time contributions, the Pit Bull became America’s sweetheart. Frequently being used for commercial advertisements and products, in company logos and in popular television shows. Perhaps the most famous Pit Bull was Petey, the adorable ring-eyed cutey featured on Little Rascals. The pit bull was also a favorite among politicians, scholar and celebrities. Helen Keller, Theodore Roosevelt, Thomas Edison, Mark Twain, Fred Astaire and Humphrey Bogart, just to name a few, all had pit bulls as companions. After WWII, Pit Bulls began to be seen more as “regular dogs”. They were given attention neither more or less than any other breed. Surely, underground fighting must have taken place, but it seemed this was a rather small percentage. The vast majority of American Pit Bull Terriers were used for herding, hunting or guardian purposes, but most were bred and kept primarily as companions. In 1976, the Supreme Court passed the Animal Welfare Act of 1976. This groundbreaking act made dogfighting officially illegal in all 50 states. Today, dogfighting is a felony in all 50 states, the District of Columbia, Guam, Puerto Rico and the U.S. Virgin Islands. In most states, the possession of dogs for the purpose of fighting is also a felony offense. As well as, being a spectator at a dogfight is illegal in all states except Montanan and Hawaii. Unfortunately, many times when an act is made criminal, it draws the attention of criminals. As dog fighting began to re-emerge in the 1980’s, animal advocates put an increased focus on the cruel, barbaric and illegal blood sport. The inadvertent and unfortunate side effect of this new movement was that some people began to seek out Pit Bulls for illicit purposes. The criminal set began trying to squeeze these dogs into a mold they were never designed to fit. The breed who was once bred to treat every stranger like a long-lost friend was now being used as guard and protection dogs and were being fought in underground fighting rings. The demand for pit bulls led to many owners breeding their own dogs without concern for temperament or socialization and for the purpose of making a profit, rather than providing a responsible home. Soon Pit Bulls were associated with poverty, “urban thugs” and crime. They were viewed as money-making commodities instead of family members and companions. 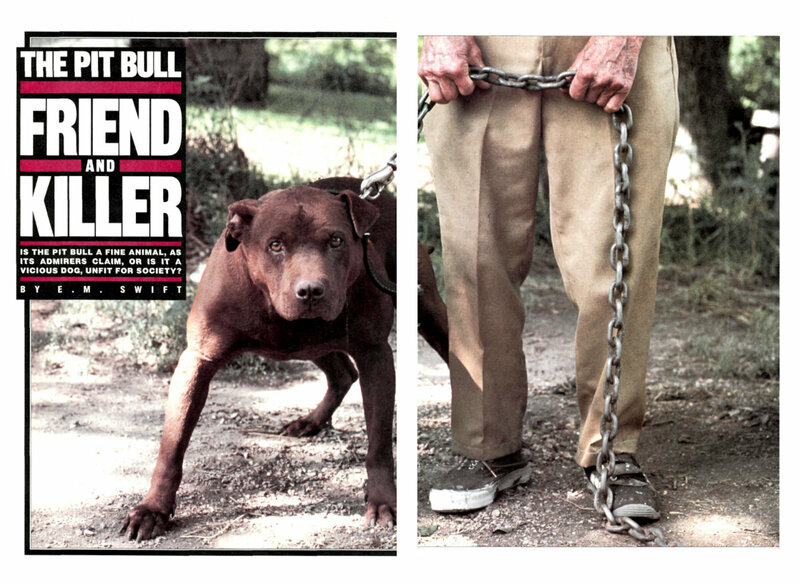 While there is no defining moment in which to point to and say “here is where it all went wrong”, many trace the turning point to 1987 in which a Time Magazine cover story was titled “The Pit Bull Friend and Killer”. 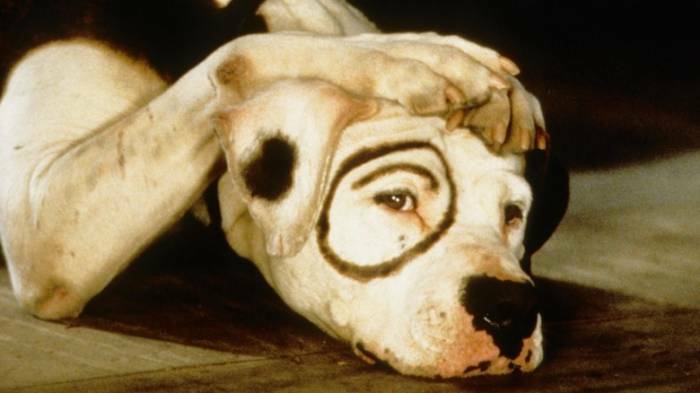 Thanks in large part to the media, the All American Dog began to be exploited at new lows and stereotypical images like what was seen on the infamous Sports Illustrated issue, “Beware this Dog”, seemed only to confirm for the public that these dogs were to be feared and should not live in homes. The Pit Bull, seen by criminals as items to be discarded and now being seen by the public as a danger, began to fill shelters at an alarming rate. The media portrayal and demonization of the Pit Bull paved a perfect path for the onset of breed specific legislation. (The first recorded city to pass BSL was Hollywood, FL in 1980). BSL began to crop up in select places as the dogs began to be used as a political platform by opportunistic politicians. Learn more about BSL here. 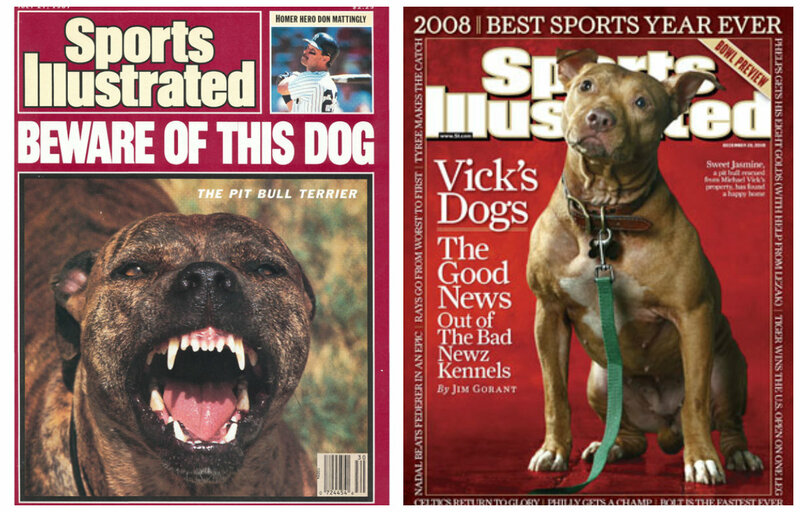 Twenty years after the breed took its first major PR hit in the media, Sports Illustrated returned to show us a different face of the dog, one that invokes sympathy and even surprise from a re-educated public. Today, Pit Bull type dogs continue to receive more and more positive media attention, due in large part to education and advocacy organization devoted to promoting an accurate image of these dogs. They are loved and owned by several prominent figures such as Jessica Biel, Jon Stewart, Kale Cuoco, Rachel Ray, Jennifer Aniston and many more! They can be seen in the show ring, in various dog sports including agility and weight pulling, in law enforcement work including narcotics detection (check out former Adopt-A-Bull Peaches), in search and rescue, in the armed forces, as service dogs, in our homes and as therapy dogs, like Love-A-Bull’s Pit Crew, reaching out and offering comfort to people in hospices, children’s hospitals, veterans programs, women’s shelters, etc. Pit Bulls are once again becoming the All American Dog!